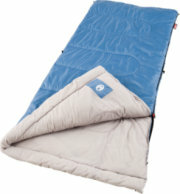 GearBuyer has a large selection of Coleman Sleeping Bags in different shapes, insulation, and sizes. Down Sleeping Bags are warmer and more compressible than Synthetic Sleeping Bags but do not perform as well when wet. 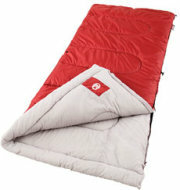 Stay warm and comfortable with GearBuyer's selection of Coleman Sleeping Bags. 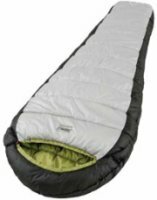 Coleman 20-70 Degree Signature Series Multi Comfort Sleeping Bag - Choose from three layers of warmth with the Coleman 20-70 Degree Signature Series Multi Comfort Sleeping Bag. Lightweight sheet for a hot summer night. Fleece layer for extra warmth on cool night. 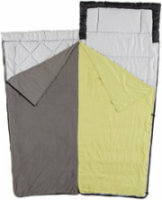 Use the lightweight sheet and fleece layer along with the sleeping bag cover for comfort down to 20 degrees. One bag has got you covered from 20 to 70 degrees!Diamond ripstop polyester shellBrushed polyester linerMultiple layers designed to keep you comfortable in temperatures from 20° to 70°Pillow Pad keeps head on bag and bag off faceHigh-loft, hollow core Coletherm insulationNo-snag zipperRoll Control makes rolling easier. Coleman Lassen 20 Sleeping Bag - The Coleman® Lassen™ 20º Sleeping Bag keeps campers comfortable without weighing them down. This traditionally-styled bag uses 4 lbs. of Coletherm® insulation to keep campers sleeping comfortably in temperatures from 40º down to 20º. The bag is packed with COMFORTSmart features like a ZipPlow design zipper to prevent snags, Comfort Cuff to surround your face with soft comfort, and Roll Control for easier rolling. This 33'' x 75'' bag sports a lightweight polyester outer shell with a comfortable and warm cotton flannel liner inside. Coleman Double High QuickBed Airbed 120V Pump Combo - Twin - Coleman QuickBed Airbed - Double High with 120V Pump Features. Coleman QuickBed Airbed - Double High with 120V Pump. Let s you enjoy the great outdoors in comfort and style with the Coleman Double-High Quickbed Air Bed Combo. Designed with 120V Pump and Wrap 'N' Roll System it is easy to inflate and deflate, thanks to the included Coleman 120V Pump and Coleman's extra-wide Advanced Double Lock Valve provides two sealing points to guarantee leak free. 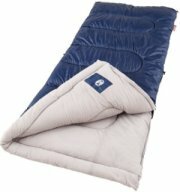 Coleman Brazos Cold Weather Sleeping Bag Navy - If you're in search for the perfect sleeping bag, this is the one for you. The Coleman Brazos Cold Weather Sleeping Bag features four pounds of insulation, assuring great warmth. It has a polyester cover with a soft tricot fiber blend liner. It locks in insulation providing guaranteed warmth even on the coldest of nights. 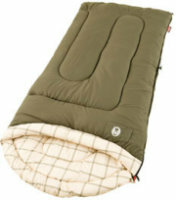 The Coleman Brazos Cold Weather Sleeping Bag is machine washable and easy to maintain. Coleman 4-in-1 Quickbed Twin/King Air Bed - Comfortable, durable and versatile, the Coleman® 4-in-1 Quickbed® Twin/King Air Bed is perfect for home or camping use. The two mattresses can be used as two separate twin mattresses, stacked to form one double high twin or zipped side by side for one king size mattress. Fits standard twin and king size bed sheets. Comfortsmart Coil System contours to your body for better support. Soft suede top for a more comfortable experience. Coleman Fleece Rectangular Sleeping Bag Sleep Sack - Coleman Fleece Rectangular Sleeping Bag Features:Stay cozy and comfortable when you curl up in this 50°, 33 in. x 75 in. polyester fleece sleeping bag. Zippered opening. Elastic loop for storage. Sleep SackAdds 12 degrees when paired with another sleeping bag. Assorted colors. Sorry no choice..
Coleman Palmetto Sleeping Bag - The Coleman® Palmetto Sleeping Bag is a rectangular, cool weather sleeping bag made for camping temperatures between 30 and 50 degrees. Perfect for Family camping!Polyester cover with soft tricot fiber blend linerZipPlow plows fabric away from zipper to prevent snagsThermoLock construction reduces heat loss through the zipper, keeping you warmerColetherm® insulationFiberLock prevents insulation from shifting, increases durabilityZipperGlide tailoring allows smooth zipper operation around the cornersQuickCord for easy, no tie closureComfortCuff surrounds your face with softnessRoll Control locks bag in place for easier rollingCommercial Machine washable. Coleman Comfort Sleeping Bag - The sleeping bag for any weather condition -multiple layers so you can make yourself comfortable. The Coleman Adults' Outdoor Signature Gear 20°F Sleeping Bag keeps you comfortable on summer nights and warm in cold weather in temperatures between 20° and 70°. The 4 lb. of Coletherm insulation keeps you warm, and the pillow pad helps keep your head on the bag and the bag off your face. Roll Control makes the bag easy to roll, and the no-snag zipper ensures easy entry and exit. Coleman QuickBed Airbed 4D Pump Combo - Queen - Soft suede topped air mattress for luxurious comfort in camp or traveling. Heavy duty PVC constructionFits standard sized sheetsSoft suede top for luxurious comfort4D pump included78” x 60” x 5”Airtight™ System/Double Lock™ ValveWrap 'N' Roll™ storage system. 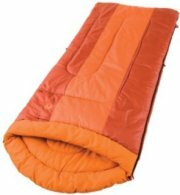 Coleman Sabine Tall Cold Weather Sleeping Bag Rust - With the Coleman Sabine Tall Cold Weather Sleeping Bag, you can be prepared for a camp out int he woods most any time. Portable and comfortable, the Coleman Sabine Tall Cold Weather Sleeping Bag bears 5 pounds of insulations, so that you can stay warm even in below freezing temperatures. 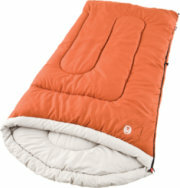 Plus, this sleeping bag is large enough for even the tallest campers, but is still easy to pack up for travel. Coleman Rechargeable QuickPump - Coleman Rechargeable QuickPump Features. Coleman Rechargeable QuickPump. The Coleman Rechargeable QuickPump has a new ergonomic design that rapidly inflate or deflate just about anything anywhere. Whether it be an airbed, kayak, toy or to deflate a space bag for travel, the Quickpump is absolutely amazing and lets you inflate or deflate your favorite toys in no time. It features an ergonomic design, a rechargeable inflation system, with a built-in rechargeable/recyclable battery pack and a 120-volt battery charger. Coleman SUV QuickBed - Turn virtually any SUV into a camper with this adjustable two-chambered air bed. Guaranteed leakproof, its Airtight™ system has a Double Lock™ valve to lock in air twice. Valve opens extra wide for quick inflation and deflation. Features sturdy ComfortSmart coil design that is stronger, firmer and more comfortable than standard-beam construction. Heavy-duty PVC construction with a suedelike top. Wrap ’n Roll™ storage system with attached storage bag for easy packing. Coleman AC 120V QuickPump - The Coleman® AC 120V QuickPump™ is a high volume air pump that inflates and deflates airbeds, beach toys and most other inflatables fast. This unit plugs into any standard electrical outlet. Pump includes Coleman® Double Lock Valve™ and Pinch Valve adapters and can also be used with a Boston valve. Made in China. Manufacturer model #5999C120/2000012139. NOTE: Assorted Colors of black and red. Sorry, specific color requests cannot be accommodated. Coleman Queen Double High Air Bed Air Mattress - Coleman® Queen Size Double High QuickBed® Air Bed Features:Conveniently fits deep-pocket queen size sheets. Soft suede top for luxurious comfort. Advanced Double Lock Valve locks in air two ways. Inflates in less than 3 minutes with electric QuickPump unit (sold separately). Coleman® Airtight® System guarantees a leak-free inflatable..
Coleman QuickBed Airbed - Twin - Soft suede topped air mattress for luxurious comfort in camp or traveling. Heavy duty PVC constructionFits standard sized sheetsAirtight™ System/Double Lock™ ValveWrap 'N' Roll™ storage syste74” x 39” x 5”. Coleman QuickBed Airbed - Queen - Get in and out of bed easier with a Coleman QuickBed Queen Double High Airbed. The added height and 35 internal coils provide superior support, while a soft top offers relaxation for sleepers on the go. With durable PVC construction and the Airtight System, your airbed is guaranteed to keep its customized firmness all night long. The integrated Wrap `N` Roll Storage System allows you to fold, roll and store the airbed quickly—making cleanup easy. Coleman 0-20 Degree Signature Series Mummy Sleeping Bag - The Coleman 0-20 Degree Signature Series Mummy Sleeping Bag is the perfect choice for cold weather camping. 3 lbs. 8 oz. of Coletherm synthetic insulation and offset quilt construction provide exceptional comfort and warmth on cold winter nights. Durable diamond ripstop polyester shellDouble-batt, offset quilt construction eliminates potential cold spots100% polyester linerHigh-loft, hollow core Coletherm insulationTwo-way zipper for maximum ventilationSemi-sculpted hood provides better heat retentionFull-length draft tube eliminates draftsStuff sack includedBox shaped foot gives feet extra room. Coleman Richland Creek Cool Weather Sleeping Bag Black - A quality sleeping bag is essential to a good night's sleep out in the wilderness. The Coleman Richland Creek Cool Weather Sleeping Bag is a great option for hikers and campers looking for a durable bag that is both easy to carry and warm for those cooler nights in the wild. The bag features three pounds of Coletherm insulation and has a brushed polyester cover and liner. Coleman Calgary 20 Degree Sleeping Bag - The Coleman Calgary 20 Degree Sleeping Bag features a contoured shape, so your head is always on the bag and the bag is never on your face. Polyester construction for easy care. No snag patented zipper. Roll Control makes rolling easier. Machine washable. Contoured design keeps head on bag and bag off face..
Coleman Full Air Bed Air Mattress - Coleman Flocked QuickBed® QuickPump Full Air Bed Features:Coil construction provides more strength, firmness, and comfort than beam construction. Wider side gussets add comfort and stability. Rayon flocked top provides a slip-free surface. Exclusive PVC formula is 15% more puncture resistant. Includes Coleman® QuickPump®-operates on 4 D cell batteries (not included). Wt. 9.8lbs. Valve makes inflation and deflation fast and simple. Advanced Double Lock Valve® with two sealing points..
Coleman Self-Inflating Camp Pad - Coleman Self-inflating Camp Pad Features. 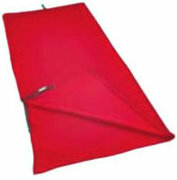 Coleman Self-inflating Camp Pad. So you are planning a quick trip to a friend s house but you don t want to have to carry to much stuff. Just take your reliable Coleman Self-inflating Camp Pad with the pillow. This pad is very easy to operate since it has a self-inflating free-flow valve. Another great benefit of the pad is that it is made of a tough nylon material making it very durable and weather resistant.